This preparation for sesame chicken gets "skinny" by using only a dash of oil in favor of pressure cooking the chicken and sauce together. Spicy sriracha is balanced with sweet honey and savory soy sauce. Grated fresh ginger has a firey and pungent flavor and also acts as a meat tenderizer. Everything comes together quickly and easily as a one-pot meal in the MultiPot Pressure Cooker. Try this recipe for either a weeknight family dinner or a meal prep recipe for weekday lunches. Stir soy sauce, chicken broth, honey, tomato paste, sriracha, ginger, and garlic together in pressure cooker pot until smooth; add chicken and turn to coat. Seal lid on pressure cooker, turn steam-vent handle to Sealing, and cook on High Pressure for 3 minutes. Immediately relieve pressure by carefully turning steam-vent handle to Venting. Remove lid from pressure cooker; press Sauté. Whisk cornstarch and water together in a small bowl until no lumps remain; stir into the sauce in the pot and cook, stirring frequently, until thickened, about 5 minutes. 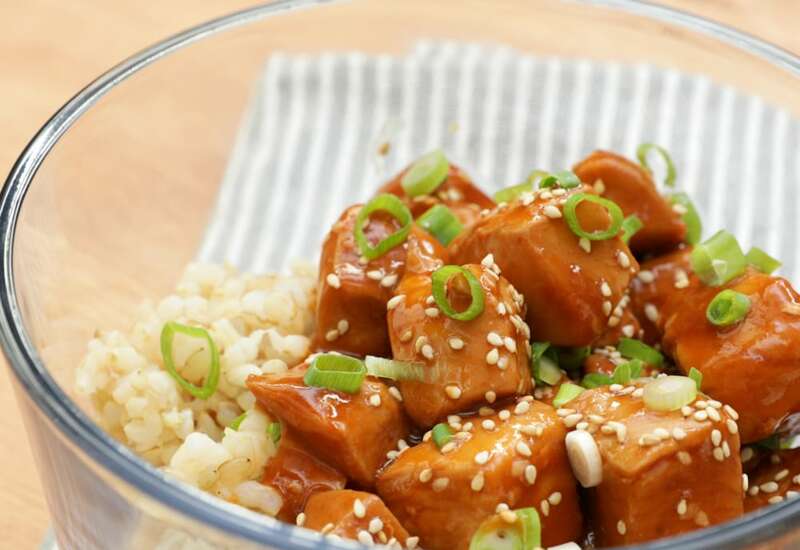 Stir 1½ tablespoons sesame seeds and the sesame oil through the chicken mixture; serve with rice and garnish with remaining sesame seeds and green onions. If using for meal prep, allow chicken and sauce to cool completely. Divide rice and chicken between 4 sealable meal containers; garnish with sesame seeds and green onions. Seal containers and refrigerate for up to 4 days. Per Serving: 583 calories; 12g fat; 55.3g carbohydrates; 61g protein; 145mg cholesterol; 1999mg sodium. So easy and delish. Doesn’t taste like goopy sesame chicken from Chinese takeout, it’s lighter and fresher feeling but with the same general flavors. Really awesome. This skinny pressure cooker sesame chicken was delicious! I had some friends over and they all loved it. I served it over rice and alongside broccoli, it was a huge hit. Definitely one of my favorites. The sauce was incredible! I loved this sesame chicken! It was a little sweet, which I like. I used low-sodium soy sauce and added extra sriracha for spice. Really delicious, and perfect with brown rice. I made this for dinner, not meal prep, and it was so yummy. Usually my kids are super picky eaters, but they loved this. I just skipped the sriracha so it wouldn't be spicy. Anytime I don't have to use oil is a win for me! I used brown rice, plain sesame seeds (not toasted), and light soy sauce. Yum! It doesn't get any easier than this! My MultiPot is in regular rotation, and this is one of my favorite recipes. Thanks Caroline! It was easy to make and my whole family LOVED it. This was my first recipe that I tried. I used Franks hot sauce instead and powdered ginger and it was still yummy. I used low sodium soy sauce but next time I’ll use coconut aminosI didn’t know if I was going to ruin this dish so I didn’t want to waste my precious expensive coconut amino’s. I really cannot believe that chicken cooked in three minutes. I was very skeptical but I’m a believer now! Thank you for the quick yummy dish! Ok so I think the recipe looks great!! Can I use an instant pot? First time using an InstaPot and this recipe was a success! Spicy but not to spicy! Husband even had seconds.